Ranta was born in 1922 and grew up in the Pretoria area. After leaving school, she worked as a ‘tea girl’ at the Pretoria mint, and later took employment as a typist for the African Iron and Steel Workers’ Union. By the early 1950s she was an active trade unionist and shop steward for the Garment Workers’ Union. She joined the African National Congress (ANC) in 1948, was elected to the Transvaal executive of the ANC Women’s League in 1954, and in 1955 became the league’s national secretary. 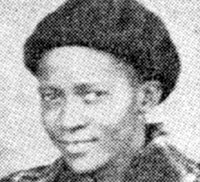 She was also on the executive committee of the Federation of South African Women (FEDSAW) and played a leading role in protests against the extension of passes to women in the mid-1950s. In December 1956 she was one of the 19 women charged with treason, but charges against her were dropped in December 1957.